After we went to Tai Yang Dao (Sun Island) and Tiger Park, we walked on the other end of Zhongyang Street, towards Songhua River. There was an underground passenger walkway to get across the intersecting street to the river. You can get to the river via the underground passenger walkway or by crossing the street with lots of cars passing by. We used the underground walkway on our way back to the hotel. There was a mall underground on the way out! We went inside the mall to check it out, but it was full of clothing shops. A baking aroma caught my attention near the mall entrance, and we traced it to the source. It was a vendor selling pineapple custard filled pastries! The pastries were freshly made onsite with the machine shown in the photo above. First, half of the mold was filled in and baked for a bit before the cream was placed on top. Then the other half of the mold was placed on top; there was a hole in the second mold to complete the other half of the pastry, to ensure that the cream is in the middle. 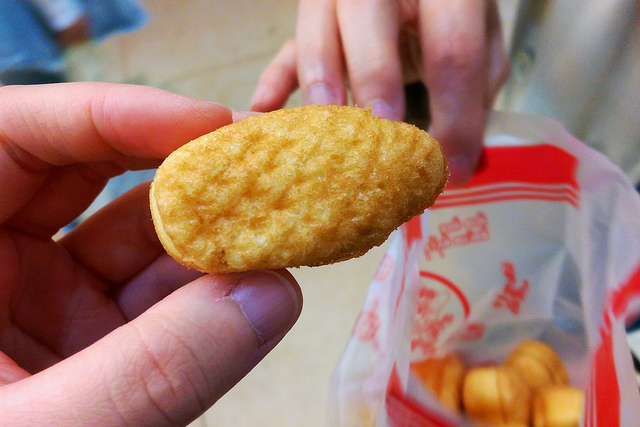 A bag of pastries were sold for 10 yuan per bag (~$1.63 USD). The pastries are called 多味菠蘿蛋撻 (duo wei bo luo dan ta), which loosely translates to “many flavor pineapple egg tart”. Perhaps there are different cream flavors. They refered to the pastry as “egg tart”, but I will refer to it as pastry as it is not really an egg tart.. I counted 10 pieces inside our bag. A bag was shared among the three of us. One stayed back at the hotel to rest up. The pastries resembled a pineapple on the outside, from the mold. The cream filling had a hint of pineapple flavor as well. Since it was freshly made, it was steaming hot and I nearly burned my tongue on my first bite! Eating the pastries kept us warm outside as the afternoon got cooler.